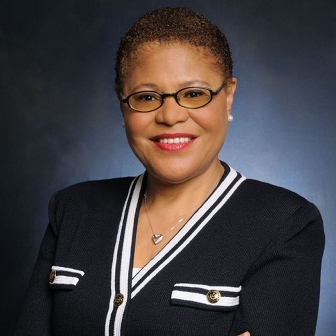 Congresswoman Karen Bass made her rounds last week, remembering and speaking on the civil unrest that began on Florence and Normandie 25 years ago and imparting lessons that she learned while being involved in the rebuilding process. “The most important lesson for South L.A. and inner city communities in general, the only way conditions are going to improve is if the people who live in the community take the lead,” she told the Sentinel in an interview last week. She had started the Community Coalition, a neighborhood improvement program two years earlier, but said the events of 1992 greatly affected its impact. “The civil unrest really expanded the membership of the Community Coalition,” said Bass. “We led a grass roots campaign to prevent the rebuilding of the liquor stores. “That was really important to the development of the organization. It expanded the outreach that Community Coalition was able to have. Over 200 liquor stores were burned down and we waged a campaign to prevent the stores from rebuilding. The melee began on a Wednesday afternoon, when the announcement came over the airwaves. Four Los Angeles police officers who were caught on videotape severely beating motorist Rodney King were found not guilty of the crime. Soon after, a handful of young black men purposefully walked into a Korean owned liquor store, took some merchandise and assaulted the store owner’s son. Soon after at Florence and Normandie, truck driver Reginald Denny unknowingly drove into a mob who dragged him from his truck and beat him almost to death. The city went up in flames. Over 60 people lost their lives and property damage was estimated around $1 billion. Bass said that though she feels that Los Angeles is in a good place, it is very possible that the events of 1992 could happen again in other parts of the country. “I think it can happen again. I think it’s going to happen again,” Bass said. “I don’t know if it will be in Los Angeles but considering the administration that we have now, and considering the person who is the attorney general Jeff Sessions, who just [recently] announced an effort to go after gang members. To me it sets the stage for less accountability from police.